The books haven't arrived yet...and I wondered whether David had hidden them this morning, knowing that once I had opened them there would be nothing done for hours! He promised me it wasn't so, and so I finished the green medallion as I watched over Raphael, and his friend in the skate park at Puy l'Eveque this afternoon. 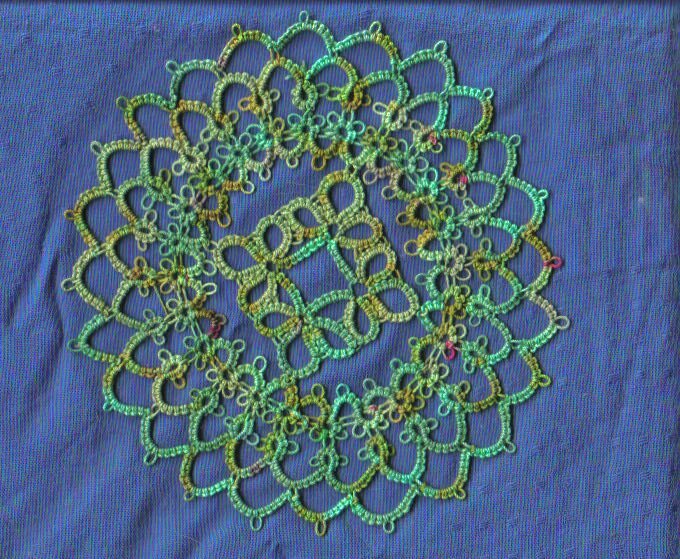 It's from the Julia Saunders book, and I like the lacy middle row. I am running out of hand dyed thread, but I still have enough red, I think, for one more. I'm not counting the little purple thing, it was just done to use up thread on the shuttle, but I quite like it just the same! I simply love the hand dyed threads you've been using! I'd cry if I started something larger though, like a doily and ran out of it. Do you have plans for what you're going to do with all of these motives? That is why the challenge is such fun, it's an excuse to keep making even though there's absolutely no use for the finished objects! I love the hand dye threads. The colors are so pretty!!! The motifs are lovely too. 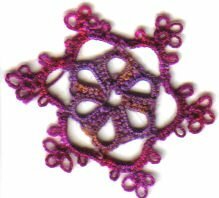 You can use the motifs as ornaments in a Xmas tree or sew them all in a shirt. Mine will be "adopt" by my mom for her Xmas tree and a few t-shirts. The colours of your hand-dyed threads are really stunning, not just this one but the ones previously as well. I like it. 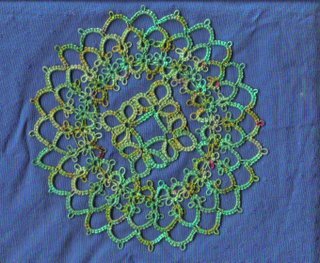 Your hand-dyed threads are absolutely scrumptious (to say nothing of that wondering tatting... your clovers are just beautiful. thank you for sharing your work! !